Cyclists in London wondering how to vote in the mayoral election this year will have been waiting for Ken Livingstone to make some clear statement of his policies with regard to cycling. As the Londoners on Bikes website put it, transport is the one thing the Mayor of London really controls. One of the few things that is really in the power of the Mayor to deliver is better conditions for cyclists, particularly on the main roads directly controlled by Transport for London, of which the Mayor is Chair. Q: We got a lot of questions about cycling. This [from babybat] is typical: "I'd like to know how you plan to make cycling safer - specifically, will you be investing in proper Dutch-style segregated bike lanes as proposed by the London Cycling Campaign? A: We had a plan which we were about two-thirds of the way through, the London Cycling Strategy, which was putting in, in some places, separation. In some places you can put in separation. Most of our roads are wide enough to do that. And we got a long way with all the boroughs that were sympathetic towards this. Johnson scrapped that and went for this "paint a bit of blue down the road" [the cycle superhighways]. Q: Would you keep the blue down the road? A: At the moment it is most probably more dangerous than safe, because people come into the blue lane and they assume there's some sort of safety. The regulations on it vary from here to there. Suddenly it stops and starts on the other side of the road. Two cyclists who were killed at the Bow roundabout junction – there's a classic example of what's wrong. Transport for London spent ages negotiating with local cycling groups to put in cycling safety measures. Those went up to the mayor's office. TfL specifically said this will not be safe for cyclists without these measures. The reply was: "The mayor's priority is traffic flow." Now they are in a great panic because of the police investigation.There could be a charge of corporate manslaughter. That's the worst example. Q: Someone [benbro] raised this on the blog. He wants to know if you think there's a strong case for a corporate manslaughter charge. A: I think there is. It's more obvious with the captain of the Italian cruise ship, but here Transport for London officials told the mayor's office cyclists would be at risk if they didn't put these measures in. They were turned down in order to prioritise – when Johnson says traffic flow, he means more speed for cars. What we'll do, we'll get Jenny Jones, who was my cycling adviser and Green assembly member and she's a candidate for mayor, she'll be on this. She'll be in charge of driving forward the cycling agenda. The TfL board is going to be chaired by deputy mayor, Val Shawcross. And we will prioritise putting in the safety measures that Johnson has put out. Q: Would you keep the "Boris bikes"? A: When I started this in July 2007, my instruction to TfL was simply go to Paris, take the Vélib' scheme and bring it to London. For some reason, they did not take the Vélib' scheme and they've gone for this much more expensive one that Boris has brought in. I would like to see the bike scheme London-wide. But the cost per bike and docking frame is £12,000. So any major extension starts running into hundreds of millions of pounds. You've got to get it cheaper. The manufacturer may back off and cut the price if they're told if they don't do this, we will bring in another operator to do it. It's nice to know they got a lot of questions about cycling. Cyclists are a small minority, but, by and large, an intelligent, vocal and politicised one. Well done, cyclists, on the lobbying. Also it's good to see that LCC's Go Dutch campaign is having an impact on the debate, even before it is officially launched. It seems that Livingstone, despite not being a cyclist, has done his homework, and knows what cyclists (and the press, and GLA) have been talking about, with regard particularly to unsafe junctions. Now I will criticise Ken's attempt to rewrite the cycling history of his last administration. I don't particularly remember this "London Cycling Strategy" of which he speaks, and I was closely involved with cycling when Ken was mayor. What I do remember is the network scheme that was ongoing at that time, the "London Cycle Network Plus". This made very little progress, having little political backing, and being mainly on borough roads where the Mayor had no direct control. It embodied a confused strategy, with some of the routes being convoluted, up-and-down backstreet affairs inherited from the original LCN (such as the slalom-like route just east of Finchley Road in Hampstead) that no commuter would use, and other routes being entirely theoretical ones on main roads with dangerous junctions, like the A5, which TfL was unable to get cycle-hostile councils like Barnet to do anything about. 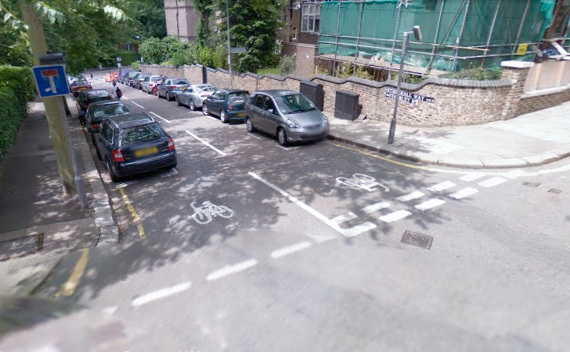 Money was spent on signposting the incredibly convoluted and hilly "Finchley Road alternative route", seen here at Netherhall Way NW3, part of the LCN+ project, a legacy of Ken's last time as Mayor, and the avoidance of the issue of cycle safety on the main roads then. Since the LCN+ strategy was basically not about segregation, or even road-space reallocation, there was no coherent picture to put to councils, be they pro or anti-cycling, of what was supposed to be put in place on proposed main road routes like LCN+5 on the A5, and in the end it became a strategy just to spend the money somehow. The money for the A5 route just got spent on a few blue signs, cycle logos on the road, and speed tables on side-roads in Brent – none of which did anything to make cycling no the A5 any better. Not a cyclist himself, and not having really absorbed the importance of cycling, Livingstone took a hands-off approach (like his successor) and allowed the LCN+project to drift into a mire of inaction well before he was defeated at the polls. He was not "about two-thirds of the way through it" as he claims now: it was years behind schedule, only the easy (back-street) bits had been done (badly), the difficult (but critical) stuff on the main roads and junctions and bridges and pinch-points in the network had all been left till later because nobody knew if Ken genuinely backed prioritising cycling, or if he was prepared to take on recalcitrant boroughs, and the project had essentially run into the ground by the time Boris took over. I am not sure that any segregated (or separated, as Ken put it) routes were created as part of LCN+. The only one that might have been is the Cable Street route. This suffered from many design flaws. The better-designed segregated tracks in Camden were not part of LCN+, their construction preceded Ken's mayoral term. Having set that part of the record straight, I think we can see that Ken is responding here to a changed mood and greater determination amongst more people in London to get cycling provision taken seriously now. He is not talking about the "cheap back-street routes" any more, which used to be his main cycling theme. He is directly contradicting Boris in claiming that "most roads are wide enough for separation [segregation]". He must be talking about main roads here, otherwise the statement would not make sense. So he seems to be accepting the Go Dutch principle: "Clear space for cycling on London's main roads". When he was last mayor there was no such concrete model of a cycle-friendly cityscape being campaigned for by LCC, only ill-defined rhetoric about wanting a "Word-class cycling city". Campaiginng has changed, and that has influenced him. That's good. He is talking about putting Jenny Jones and Val Shawcross in charge of his cycling programme, two politicians who definitely do know something about cycling, even if he doesn't. One can't guarantee, on the basis of past performance, that Ken would make a better fist of cycling policy than Boris. We have to make a judgement on the information we have. I'll be keeping my eye out for any further statements Ken, Boris, and the other candidates make, particularly now The Times has greatly raised the profile of cycling issues. Cyclists need to keep the pressure up to secure clearer commitments from the candidates. The best ways to do this are to keep asking the questions of candidates at every opportunity, to support the LCC's Go Dutch campaign, the Cities fit for Cycling campaign, and Londoners on Bikes, to attend protests such as Bikes Alive, and particularly to turn up at the huge protest ride planned by LCC for 28 April. Details for this are not available yet, but set the date aside. Ken is not a cyclist because he cannot ride a bicycle. He is very focused on transport at the human scale. Anyone who thinks Boris is OK because he rides a bike needs their head testing! Cycling aside, Ken was going to have an expensive, taxpayer funded celebration of the 50th anniversary of Castro's regime in Cuba. If he was so concerned about the cost of cycling schemes why was he prepared to spend lots of it celebrating a regime which doesn't allow free speech, a free press, free elections, free trade unions, fair trials or freedom to travel? Very odd, especially for a man who claims to stand up for the rights and freedoms of the workers.